Lets start with nails, I'm so into muted shades at the moment, Kiko Sand and Essie Chinchilly fit that description perfectly. I never used to like understated nails at all but now I feel like its all I ever wear. These two shades are quite similar but I feel the Kiko one is more on the beige/ pink side whereas Chinchilly has more of a grey tone to it. For lips there are a few Mac products I've got really into. 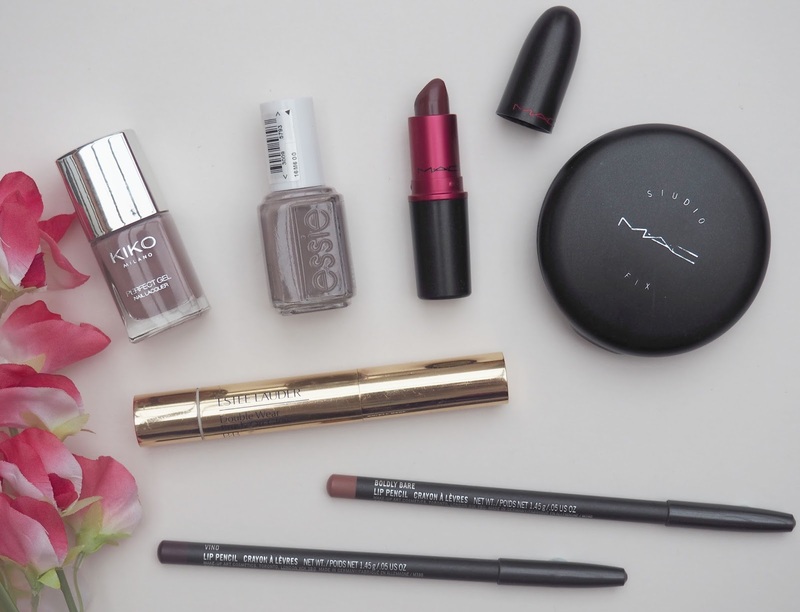 Firstly, Mac Boldly Bare lip pencil has been something I reach for all the time either to just use on its own or paired with some of my favourite lipsticks. It's a peach toned brown shade but not too on the dark side which I find makes it really wearable on my skin tone. Also, this lip combo is just so amazing I can't get over it, Mac Viva Glam III and Mac Lip Pencil in Vino. I started off only wearing this on special occasions, girls nights out etc but now I just where it whenever it takes my fancy. When looking at Viva Glam III on its own, even though its a deep purple shade it also has a bit of brown in there which makes it a pretty unique shade. I like to bring out the purple in it a bit more which is why I pair it with Vino. The Estee Lauder BB Highlighter has been an absolute lifesaver for me this month as I've been so busy and therefore pretty tired. I pop this over my usual concealer to add a bit of brightness to the under eye area and hide any tell tale dark circles. Anything that makes me appear fresh and awake gets a big thumbs up and this is definitely in that category. I don't use this on its own as a concealer very often as it is quite sheer coverage but to add a bit of life to your skin this works a treat. Finally, a product that I really thought my love affair was over with, but no! The Mac Studio Fix Powder Plus Foundation is a very heavy duty powder that is supposed to be used as a foundation. I have to admit I don't use it that way as I like my foundation to be a liquid one but if I'm needing my make up to last a really long time and to keep shine at bay then I load up a brush with this and buff it into my skin. It does look very full coverage using it this way and I wouldn't wear it everyday but sometimes you just need it! Also, you get so much in here that I still don't seem to have made a dent in mine despite having it forever. I'm hoping the weather gets a bit better throughout April so I can start to use some of my fave Spring time products, exciting!